Thinly sliced beef is the key ingredient in Shabu-shabu, but the real key is the restaurant patron’s hand at dipping it in a boiling hot pot of water or broth, adding in select vegetables and tofu for that perfect taste. Itoya specializes in Shabu-shabu and sukiyaki, where the customer does the cooking after being presented the most choice vegetables. 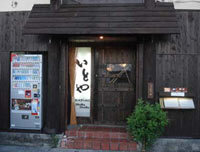 Itoya is special, drawing customers to the cozy restaurant with a bamboo motif in Okinawa City. 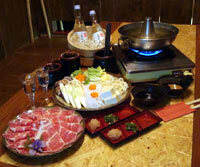 Shabu-shabu is a Japanese hot pot, very similar in style to sukiyaki, with both cooked and eaten at the table. A Shabu-shabu dinner begins with the raw meat, in Itoya’s case paper-thin slices of quality beef, and vegetables that traditionally include Chinese cabbage, chrysanthemum leaves, nori (an edible seaweed), onions, carrots, shiitake mushrooms and enokitake mushrooms. Tofu tantalizes the taste buds as well. The quality beef steak slices and vegetables are submerged in the pot of boiling water for a few seconds to cook, then eaten after being dipped in special sauces and served with rice. Shabu-shabu, incidentally, roughly translates to ‘swish’swish’. It’s a dish that traces back to the 13th century, when Genghis Khan used the single pot cooking technique to feed his Mongol troops, who gathered around to cook together. It first gained popularity in Osaka in 1955, and Itoya has further refined the specialty dish here in Okinawa. Sukiyaki, which is very much like Shabu-shabu, although perhaps a bit sweeter. The cooking pot is the same, but instead of water there’s a broth typically a mixture of soy sauce, sugar and mirin. The vegetables and tofu are the same, and so is the cooking technique. The first sukiyaki restaurant opened in Yokohama in 1862, even before Japan opened to foreigners. Itoya makes its customers feel relaxed, basking in the Japanese style mood. The restaurant seats 44, plus there’s a private party room available. Both Okinawan awamori and Japanese saki are available at Itoya. Beef Shabu-shabu for two persons is ¥3,150. The same meal, with ingredients for four people, is ¥6,300. The beef sukiyaki for two persons is ¥2,940, while it is ¥5,880 for a party of four. All taxes are included in the prices. Itoya, located at 1-26-1 Awase in Okinawa City, is open daily except Thursday 5 p.m. to 11:30 p.m. Last orders are accepted at 11 p.m. To visit the restaurant, exit Kadena Air Base Gate 2 and proceed straight through Takahara intersection, past Mos Burger on the left at the big intersection. Continue to the third intersection, looking for the large sign, then turn left. Itoya is on the right. There’s free parking in front of the restaurant, plus a separate parking lot a few meters away. Reservations are available by calling (098) 937-1108.